The large, picturesque wine region of Beaujolais sits northwest of the city of Lyon and covers parts of the north of the Rhône department and the south of the Saône-et-Loire department of Burgundy. Originally cultivated by the Romans, it was truly made into what it is today by the Benedictine monks. With the opening of the railroad lines to Paris in the 19th century, the region found a new audience, but its wines were still thought of as best consumed young. Its reputation was damaged, however, during the 1980’s when negociants like Georges Duboeuf cleverly marketed theirBeaujolais Nouveau as an inexpensive, fun and easy-to-drink red wine perfect for the wine tastes of the times. This later led to the inevitable backlash in which wine drinkers began to associate Beaujolais and the Gamay grape with cheap, fruity wine. Fortunately in more recent years (though it’s still fun to drink a bit of Beaujolais Nouveau every November), a renewed focus on quality by several traditional producers and a surge of interest in the crus of Beaujolais have rehabilitated its image as the fine wine producing region it is. There are around 18,000 hectares of planted vines in Beaujolais. Its various AOC include Beaujolais-Villages as well as 10 designated “crus”—villages located in the northernmost part of Beaujolais that have been singled out for their unique soils, altitudes, exposures and histories of producing wines that have more character and aging potential than some of the more generic areas. The vast majority of wine produced in Beaujolais is red, and must be from the Gamay grape, but there is also some white wine, from Chardonnay, as well as some Gamay rosé. Red Beaujolais is largely made by a method called carbonic maceration: instead of being crushed so that the juice, skins and yeast meet, the grapes are treated carefully to remain whole with unbroken skins before being placed in the vats. The grapes at the bottom get crushed by the weight on top and begin to ferment in the normal way, while the grapes on top takes place within the grape, berry by berry. Because the fermentation takes place within the grape, both the color and flavor are extracted from under the skin so that the tannin on the outside — often hard and astringent in young wine — is mostly excluded. What is fascinating about Beaujolais is learning how different a single grape variety can taste when it’s made in a different terroir by comparing wine from each of the crus. With that in mind, we can paint a picture in broad strokes comparing the general characteristics of each AOC of this fascinating region. This appellation encompasses all the villages of the region, and the grapes from these different villages may be blended into one wine. 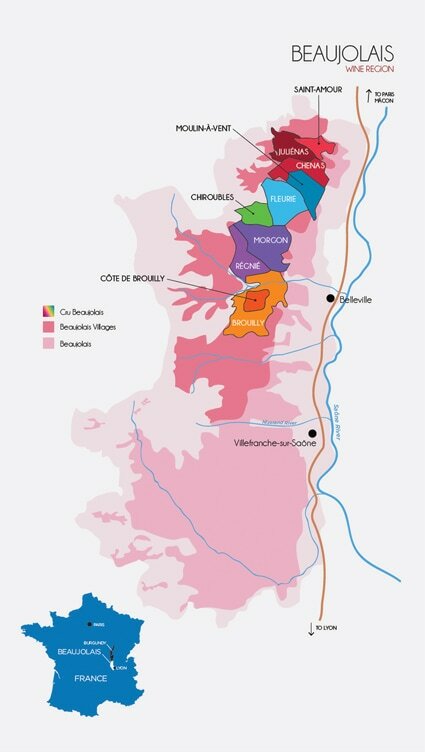 With most of these 96 villages lying in the flatter southern half of the appellation, on clay soils, Beaujolais AOC’s grapes can be more difficult to ripen than those from Beaujolais Villages or the Crus. The permitted yield here is also ever so slightly higher than in the Beaujolais Villages appellation. And finally, here the predominant winemaking method is carbonic maceration, which tends to produce more fruity and less “serious” wines. And speaking of fruity, fun wines, also included in this appellation are the festive Beaujolais Nouveau wines, which by law are released on the third Thursday of November--making them perfect candidates for the American Thanksgiving table. This appellation covers 39 communes/villages in Beaujolais, and accounts for a quarter of the region’s production. The terrain is hillier with more schist and granite soil than is found in the regions of the Beaujolais AOC. If the grapes come from the area of a single vineyard or commune, producers can affix the name of their particular village to the Beaujolais-Villages designation, and the maximum permitted yields are 50 hl/ha. These wines are meant to be consumed young, within two or three years of the harvest. They are generally full of fruit and with just a touch of underlying minerality. Our reliably high-quality Beaujolais domaine, Domaine de Colette, makes a lovely Villages from 90 year-old vines on steep slopes. It undergoes carbonic maceration followed by a more traditional pressing, then is bottled unfiltered for maximum flavor enjoyment. This is the northernmost cru (as well as one of the smallest), whose soils approach the clay-heavy terroir of the neighboring Macon region interspersed with granite, schist and limestone. Local lore claims that this cru was named after St.-Amateur, a Roman soldier who converted to Christianity after escaping death and established a mission in the area. Wines from here show aromas of kirsch, wild peach, wildflowers and spice. And of course Saint-Amour (Saint Love) is known today as the most romantic Beaujolais of all. In fact, 20 to 25 percent of Saint-Amour sales occur in February, and a label featuring Cupid is created just for Valentine’s Day! In the far northwest of the winemaking region, this cru covers four villages and takes its name from Julius Caesar, as vines were grown on the commune’s hillsides during the Gallo-Roman period. Local growers say it is one of the most varied areas of the region, as its soils include granite to the west, ancient alluvial deposits in the east, and schist and diorites (volcanic rocks) as well as blue rocks in other zones. Still other parts have sandy soils with clay content as high as 30 percent. Juliénas is a medium to full-bodied, earthy wine with a deep ruby red color and notes of deep red cherries—which transform with a few years of bottle age into nuanced flavors that veer towards cassis—with accompanying strawberry, violet, cinnamon, red currant, peach, peony and spice aromas. This area’s name comes from the forest of oak trees (chênes) that used to cover the hillsides before being replaced with grapes. Historically, many of the vineyards that are now sold under the Moulin-à-Vent designation were part of Chénas. Soils are pink granite, red sand and quartz, components that help to create powerful wines with an often peppery, spicy finish. Typical flavors include floral aromas of rose, iris, peony, and spice with woodsy notes that develop with age. Fleurie is another northerly cru located next to Moulin-à-Vent. Soils are largely pink granite which helps give the wines a highly aromatic and feminine quality. In fact, if Moulin-à-Vent is considered the King of Beaujolais, then Fleurie might be considered its Queen. Fleurie is an elegant wine with a refined, silky body. It is deep red in color, and often delivers floral (fleur means flower in French) notes of violet, iris and/or rose, along with fruity aromas of red fruit, blackcurrant and peach. Domaine de Colette produces a perfect embodiment of the cru’s best qualities, with its floral and berry aromas shining through. With vineyards at the highest altitudes of the region (250-450 meters above sea level), this is also the coolest Cru, whose grapes therefore take about a week longer than in the other areas to ripen. Soils are granite and sand. When planting the original vineyards on some of the plots, they were so stony that individual holes had to be bored into the rock for the vines to be able to take hold. All of these factors help give the wines bright acidity, and they also tend to be refined, suave and silky, leading some to refer to Chiroubles as the most elegant cru. From its vibrant ruby red wines come floral aromas of violet, lily of the valley, iris, and peony, along with bright fruit flavors that include red fruits and berries. 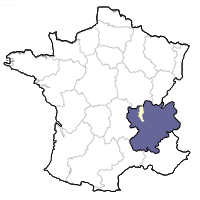 Morgon is the second largest cru in Beaujolais after Brouilly. It is made up of six climats, all of which have slightly different vineyard orientations and thus styles of wine (the most known being Charmes and Côte de Py). The soils are rich in iron oxide with traces of manganese and volcanic rock, but also contain granite, clay, and blue stones. Their unifying feature is the decomposed schist called roches pourries (rotten rocks), which some locals believe contributes to the ripe cherry aromas found in the wines. This is the closest to Moulin-a-Vent in terms of weight and structure. Its wines are full-bodied, powerful and meaty, with a deep garnet color and ripe cherry, peach, apricot and plum aromas. Like in Moulin-a-Vent, with age they can develop into earthy wines reminiscent of Pinot Noir from Burgundy. The 90 year-old vines on south-facing schist slopes of Charmes that our Beaujolais producer Domaine de Colette uses to make their Morgon give it that extra structure that allows for this aging. Régnié was awarded cru status in 1988, making it the youngest of the crus. Local lore states that the vineyards of Régnié were the first planted in Beaujolais by the Romans. They are distinguished by their pink granite soils. Having less of the prized granitic sub soils of the other crus, Régnié has the reputation of being simple, fruity and light. These aromatic wines mature earlier than some of the other crus and may be enjoyed upon release. Wines from the hillside vineyards are terrific when young with tons of aromatic peach, cherry, black currant and raspberry/blackberry flavor. Their flavor profile is fresh, structured and aromatic, with good length and a touch of mineral and spice. Domaine de Colette’s version is a delightful embodiment of all of these typical characteristics that can be enjoyed with or without food. Brouilly is the southernmost cru and has slightly warmer temperatures than the others. It covers 20 percent of the Beaujolais cru area, and has soils containing granite, diorite (a blue/black volcanic rock from the Palaeozoic era that gives this cru a unique flavor), sand and schist. Its wines are medium-bodied, with delicate and lively aromas of iris and fresh grapes, red berries, cherries, currants and plums, a bit of spice, and minerals. They tend to have good structure that is weightier in fruit than wines from Régnié or Chiroubles but not as weighty as Morgon or Moulin-à -Vent.